Added the option to change controls from swipe controls to a virtual d-pad and buttons. While using the virtual D-Pad, taunting is done by swiping down, and swiping up still opens the CMD Prompt. You can change between the two control schemes in the Options menu. Cycling is now done on by clicking on the card art diagram on the bottom right of the Disk Drive, rather than swiping on ALL control schemes. The Exit button on the top of the screen to leave that game now doubles as a back button while in the deck editor menu to avoid further confusion. Clicking the deck name also closes the menu like before. Added Social Button that redirects to the Tri Wing Discord, Twitter, and website. Tweaked network manager so players of the same version will be paired together. This is to prevent players on older versions from having their games crash when playing with newer clients. Most systems such as Google Play, Apple's App Store, and Steam prompt auto updates so that the game will always be up to date, but this allows players who get their updates in a delayed manner to still play without taxing the matchmaking servers and is a lot easier to implement than a dedicated server version checker. With the launch of Tri Wing on Android this week, I can honestly say that I’ve learned so much about the game and myself. Thanks again to everyone that has been here for the ride, both new and old. It is with great regret though that I must inform everyone that I will be delaying the PC and iOS versions of the game for a little bit longer while I work out the major issues with the Android version first. Some of you may be thinking “But why does Veak care so much about the Android build?” and it’s with this message that I wish to explain the significance of it. When I launched Tri Wing, I expected there to be issues, and plenty of them. What I did not expect however, was there to be what I view as a “game ruining experience” in that there are so many affected devices with this missing text glitch. As a result of this, a large portion of my player base cannot enjoy the game or worse, they may feel inclined to leave negative feedback for an issue I am working diligently on. If I compounded this with the release of an iOS and PC build, those are two other platforms that I have to get up and running, and that simply cannot be done in a positive and efficient manner with just one guy working on the project. The aim to move forward is to have the game at a point where all builds appear to be stable with no “game ruining bugs” present, and then learn and improve as we go. I have been so fortunate to have such a wonderful and understanding community along the journey and I cannot thank everyone enough for wishing me to take my time and create a polished product and it is because of that I feel that it is best to deliver one solid project now than three broken ones (but let’s be real, you guys will always find stuff to break 💜). So what’s the plan? When is Tri Wing coming to PC and iOS? Well in short: soon. Basically, when the Android version has all of the major issues addressed, then the iOS version will be rolled out with the same version as the enhanced Android build. From there, we’ll take another week or two and iron out any iOS specific issues, and after that, we’ll have the full PC launch and do the same thing. At that point, we should be golden. Fixed touch inputs for better responsiveness. Fixed the bug that would reset movement cooldown when walking into an unmovable location. 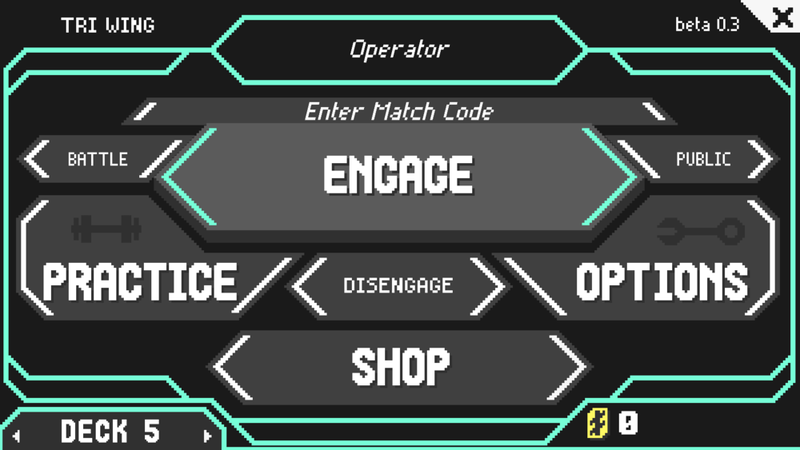 Fixed issue where the options menu would reopen and close immediately after taunting. Cards are no longer removed when a new turn starts. This is a balance test and may change. Fade Slash is now an Aggro card with costs 4/6/6. The startup time has also been slightly increased. Hello everybody! Nearly four years ago I started Tri Wing as a hobbyist project to get myself into game development. That game has evolved so much since then. I’ve added new features, new UI, new networking systems, and alongside all of that I’ve encountered so many unique problems that I’ve had to consider when designing a game. Fast forward to today, and Tri Wing is officially available for download on the Google Play Store here, with iOS and PC following shortly after. Look how far we’ve come! It’s super exciting, but there’s still a long way to go! The game is very much in beta still, which means that it’s a constant work in progress. There are still several features that need to be added, new cards and mechanics, and most notably, more bugs to address. ONE IMPORTANT NOTE TO ALL ANDROID USERS: There is currently an issue where some users cannot see the text UI of the game until they get into a game and deal damage to another player (including the training dummy). This is a serious issue that I did not see during testing and it is my top priority at the very moment. The game itself is Free to Play on mobile devices! Yep, on both Android and iOS (coming soon), Tri Wing is 100% free with all content unlocked right out of the gate. There are ads after every fight, and you can disable them buy paying $4.99. This also supports the game a lot by showing your interest in its success, but ultimately it helps cover the cost of running the servers. On PC, the game will be available on Steam for $9.99 on 1/31/2019 and will be 20% for the first week! The game is cross platform with other systems as well, so you can play with your friends at home and on the go! Throughout the next few weeks, my primary focus will be optimizing the mobile and PC builds to run as smooth as possible. I’ve already began making some quality of life changes for the mobile user experience as per player request. From there, we’ll look into balancing the game’s cards, adding new ones, and then adding new features such as Hexes. Once the game stabilizes and we can focus on game balancing, I plan on introducing Hexes into the games. Think of them as perks or abilities that can’t be found in cards since they modify your character’s stats. We’ll talk more about them soon, but until then I hope to see you all online and on the Discord server! I will also be posting weekend progress reports every one to two weeks and will have my moderators police me about it, so everyone can stay current with the game’s updates and so that I may be forward with you all. I may also stream some debugging/beta tests during the weekends as well, so stay tuned! Finally, I just wanted to thank everyone for all of the love and support throughout the years. It’s been a surreal experience and this is only the beginning! Added tile effects. Tiles can now dynamically change states beyond player ownership. Added cracked state and broken - In this state, the tile will break when a player steps off and cannot be moved onto until it regenerates in 20 seconds. The regen time is a placeholder for balance purposes. Added the "grounded" state for various attacks such as Frost Wave. In this state, attacks do not go through broken tiles, and some attacks even stop after reaching a broken tile. Auto Stopper now reduces target's auto attack by 20 (2 levels) instead of resetting auto attack damage to 10. Reclaim is now a new attack that targets the player's original 3x3 tile space and reverts all stolen tiles within that 3x3 to its owner's possession. Also knocks opponents back. All mods no longer grant 150 EX on use. Superarmor changed to only activate while attacking. A player with Superarmor on can still get hitstunned when idle or not attacking. Reclaim's original effect is now called Tile Burst. Still only activates on successful hit, and does not Advance if you are ahead on the board state. Excavate - Breaks and throws tile in front of player if it isn't already missing in a forward line. Hello operators! With Tri Wing approaching a more stable position in its development cycle, I felt the urge to be more active in my blogs and have decided to create a casual weekly blog. These blogs will cover topics of all manners in a very matter of fact way. Most entries will pertain directly to Tri Wing, but sometimes we'll deviate and explore related topics as well. I'm calling the blog, "Hotfix". To start off weekly Hotfix, I figured we should start with the most prominent topic of game development; money. Money is directly tied into the current state of the game, because all there is left to do is to finish up in-app purchases and clean up the UI a bit. With that in mind, I wanted to clarify how the business model of Tri Wing is going to operate. Snazzy shop page aka "The Cash Machine"
First and foremost, the PC version will not have any ads or in-app purchases and will be a one time purchase. 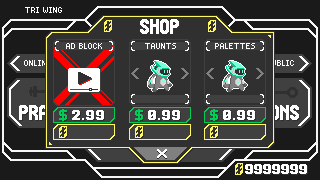 The game is set to launch at $9.99 USD with all color palettes and taunts available. The mobile version will be a free to play game with ads after each game, and in app purchases available for palettes, taunts, and an adblock. All content can be unlocked by playing the game on the mobile version, and no major content will be locked behind a pay wall. This currently includes new cards and future game modes. The idea behind this is to attract the most players as possible since the playerbase is the heart of a multi-player game. That being said, I also do not think that it's fair to the players who do enjoy the game to be put at a disadvantage because they haven't spent money on it on mobile. In the future, I'll look into other methods of monetization such as customizable titles, images, and possibly a draft mode in the distant future. So what's the point of all this? Is Veak just some money hungry greed monster? Well no, not exactly. The reality of the matter is that matchmaking servers, equipment, and licenses cost money. In a future blog, we'll discuss advertising and marketing as well. That also costs money haha. I want players to enjoy the product, but we've also got to be realistic about the costs. he end game is simple: Make a game that can fund itself for the community to enjoy. Will we get there? One way to find out. With all future important monetary decisions, I will try to be as transparent as possible. Hello operators, I wanted to give everyone a status update with the current progress of Tri Wing. Throughout the release period I've noticed that the state of the game is not up to the quality that I'd like from various standpoints ranging from the gameplay to the marketing. To cut to the chase, I'm holding back the release date of Tri Wing until I feel that the game is fully presentable with a complete package when it launches. It is at this moment I wish to explain my reasoning and go further in depth as to where Tri Wing stands and where I plan to take it from here. So the first and foremost delay comes from the actual gameplay of Tri Wing. At the moment, the network that I have built for the game is currently unstable and for a multiplayer focused game, it is crucial that I perfect this before going further with any other development. There are some key bugs that need to be fixed such as animation glitches online, to Street Fighter V levels of input delay that need to be taken care of before releasing the game to the masses. These fixes are not hard, but they do take time. On top of the network, there are a lot of UI elements in the game that need to be revamped to accommodate both PC and mobile players. Many people do not know this, but TW is a one man project that I have been working on/off for three years and the UI was recently redone since it did not have an update since the project started in 2015. Other elements like cross platform play, ads and in-app purchases for the mobile titles, and new cards/game modes also need to be implemented as well to prevent a shallow experience. On the note of shallow experiences, I also seek to revisit the marketing and image of this game, as it comes across as a shameless rip-off of the Megaman Battle Network series. This is clearly not my intention. Tri Wing is a love letter of sorts to the series, but does a lot in the gameplay department to set itself apart from Battle Network. I want to rework my trailers, descriptions, and presskits to emphasize that. 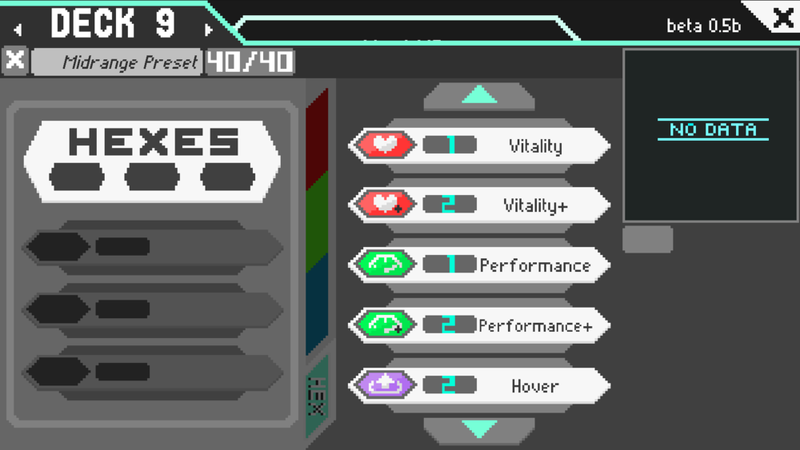 This game is not an RPG, but obviously it does take its prime influence from Battle Network's battle system. From there I took the things I enjoyed from the series and removed what I did not like with gameplay elements from other games. I want to highlight the experiences of how unique deckbuilding is, and the systems behind it reflect other card games like Magic: the Gathering, or how the EX and Focus mechanics draw influence from fighting games to chain combos together and create quick strategic planning. Tri Wing is about creating your perfect playstyle and optimizing your skills, and the marketing should reflect that. More updates will be posted soon, but in the mean time you can join the discussion on our Discord channel here. Hello everyone! With the holiday season coming up, I felt it was time for a long awaited update. So the tutorial is complete and the control inputs have been (mostly) fixed. Well, fixed enough to the point where I feel confident launching a beta test. The tutorial is quick and snappy, and teaches you just enough for you to go out and try things on your own either against another pilot, or in Training Mode against a dummy. So aside from that, the only things left before a launch are sound effects, and publicity. This works out, as my personal schedule for the holidays is hectic and along with some personal things going on in my life (like having to have my roof rebuilt and half the walls in my house demolished and redone for instance), I don't have as much time to work on TW as I would have hoped. During this period of time, I am going to focus on advertising and bug fixes before adding extra content such as cards. This will ensure that I will have a larger playerbase on launch, and that I will have time to prep for the onslaught of bug reports players were reporting.